Hannah teaches the Beginner Contemporary Dance Technique course at the Brighton Natural Health Centre. The classes are on Tuesday, 8pm – 9.15pm during term time. The courses and classes introduce basic contemporary technique as well as increases confidence with fun engaging exercises. The Beginner courses will introduce the main principles of contemporary dance including posture, alignment and use of weight, through warm-up exercises, sequences, and short free movement exploration. 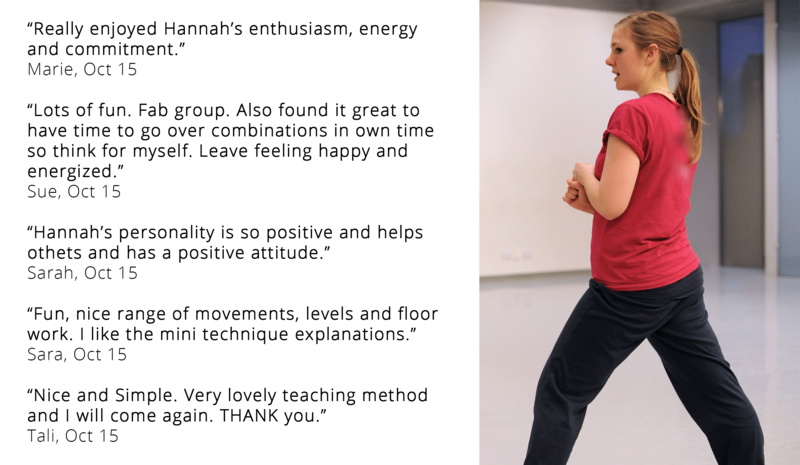 "Hannah is excellent with beginners - she gives a lot of encouragement and has a gentle way to challenge the more able students. She answers all questions from students and has enough expertise to include body differences in her teaching"